Today marks a significant second occurrence of the second transit in the pairing of Venus’s transits of the Sun since 1769. You ask why this is significant to missions, well let me explain. 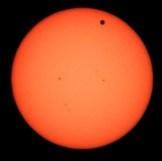 Venus’s transit of the Sun occurs when Venus travels between the Sun and Earth. This is a rare astrological event with occurrences over a hundred years apart, but when occurrences do happen, they happen in pairs. Today is the second of a pair, the last being 2004. The next pair will be 2117 and 2125. 1769 was also a second transit in a pairing and King George III had commissioned a combined voyage of the Royal Navy and the Royal Society to observe the transect from Tahiti. The voyage was to be commanded by the young Lieutenant James Cook and his ship was the Endeavour. Cook rounded Cape Horn in time to observe the transit from Tahiti. He then continued from east to west across the largely uncharted Pacific Ocean, mapping it and claiming islands for England including Terra Australis Incognita. In 1792 Carey published his missionary manifesto, An Enquiry into the Obligations of Christians to use Means for the Conversion of the Heathens, which included a theological justification for missions based on Matthew 28:18-20 and an analysis of the world’s countries and religious situation based largely on Cook’s journals. Carey’s letters from Calcutta prompted the formation of the London Mission Society in 1795. The LMS bought The Duff as a mission ship and chose Tahiti as their first mission field. The decision to choose Tahiti was largely due to the influence that Cook’s voyage and journals had had on some of the society’s patrons. From Tahiti, the mission movement spread from east to west across the Pacific through the work of native teachers and European and North America missionaries. One notable LMS missionary to Tahiti was John Williams (sometimes know as the “Apostle to the South Pacific”) was particularly instrumental in spreading the gospel through the islands with the use of local teachers. Williams had a desire to take the gospel to Vanuatu (then New Hebrides) and was clubbed to death minutes after setting foot in the country on the island of Erromango, the island directly north of Tanna. So you see, Cook’s voyage to Tahiti to observe Venus’s transit of the Sun, and the journals he wrote had a large impact on Christian mission history. It is amazing how God works! As our blessed Lord has required us to pray that his kingdom may come, and his will be done on earth as it is in heaven, it becomes us not only to express our desires of that event by words, but to use every lawful method to spread the knowledge of his name. In order to this, it is necessary that we should become, in some measure acquainted with the religious state of the world; and as this is an object we should be prompted to pursue, not only by the gospel of our Redeemer, but even by the feelings of humanity, so an inclination to conscientious activity therein would form one of the strongest proofs that we are the subjects of grace, and partakers of that spirit of universal benevolence and genuine philanthropy, which appears so eminent in the character of God himself. Sin was introduced amongst the children of men by the fall of Adam, and has ever since been spreading its baneful influence. By changing its appearances to suit the circumstances of the times, it has grown up in ten thousand forms, and constantly counteracted the will and designs of God. One would have supposed that the remembrance of the deluge would have been transmitted from father to son, and have perpetually deterred mankind from transgressing the will of their Maker; but so blinded were they, that in the time of Abraham, gross wickedness prevailed wherever colonies were planted, and the iniquity of the Amorites was great, thought not yet full. After this, idolatry spread more and more, till the seven devoted nations were cut off with the most signal marks of divine displeasure. Still, however, the progress of evil was not stopped, but the Israelites themselves too often joined with the rest of mankind against the God of Israel. In one period the grossest ignorance and barbarism prevailed in the world; and afterwards, in a more enlightened age, the most daring infidelity, and contempt of God; so that the world which was once over-run with ignorance, now by wisdom, knew not God, but changed the glory of the incorruptible God as much as in the most barbarous ages, into an image made like to corruptible man, and to birds, and four-footed beasts, and creeping things. Nay, as they increased in science and politeness, they ran into more abundant and extravagant idolatries. Yet God repeatedly made known his intention to prevail finally over all the power of the Devil, and to destroy all his works, and set up his own kingdom and interest among men, and extend it as universally as Satan had extended his. It was for this purpose that the Messiah came and died, that God might be just, and the justifier of all that should believe in him. When he had laid down his life, and taken it up again, he sent forth the disciples to preach the good tidings to every creature, and to endeavour by all possible methods to bring over a lost world to God. They went forth according to their divine commission, and wonderful success attended their labours; the civilized greeks, and uncivilized barbarians, each yielded to the cross of Christ, and embraced it as the only way of salvation. Since the apostolic age many other attempts to spread the gospel have been made, which have been considerably successful, notwithstanding which a very considerable part of mankind are still involved in all the darkness of heathenism. Some attempts are still making, but they are inconsiderable in comparison of what might be done if the whole body of Christians entered heartily into the spirit of the divine command on this subject. Some think little about it, others are unacquainted with the state of the world, and others love their wealth better than the souls of their fellow-creatures. In order that the subject may be taken into more serious consideration, I shall enquire, whether the commission given by our Lord to his disciples be not still binding on us,—take a short view of former undertakings,—give some account of the present state of the world,—consider the practicability of doing something more that is done,—and the duty of Christians in general in this matter.